Earlier today, the Marine Conservation Science Institute launched a new iPhone and iPad app focusing on great white sharks. The app, called Expedition White Shark , includes numerous features that let users learn more about these amazing animals. A game (called “Shark Life”) lets you learn about the life history of great white sharks by controlling a virtual baby great white. Users explore the marine environment near Southern California white eating fish and avoiding threats like gillnets and pollution. A “news” interface lets you keep up to date on some of the latest exciting discoveries the Marine CSI team makes, and you can learn more about great whites from the “facts” tab. The app also includes numerous photos and videos of great whites and the research team in action.The coolest feature this app contains, however, is the ability to track satellite-tagged great whites. This feature, along with the videos, works best when the device is connected to WiFi. Early reviews by others indicate that it is much easier to read all the text on the iPad version (not surprising given the larger screen), but I had no difficulties reading everything on my iPhone. 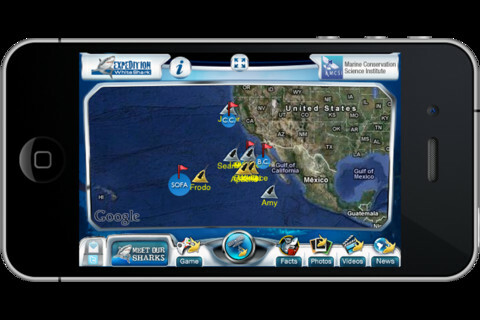 The Expedition White Shark app is a great public education and outreach tool, and I encourage ocean lovers to check it out. The $3.99 cost supports ongoing great white shark research at the Marine Conservation Science Institute. To learn about more ocean-themed iPhone apps, see Bluegrass Blue Crab’s post. Get marine conservation into the national political conversation with Americans Elect! Thank you David! Of course everyone remembers Junior, the shark that caused so much debate on your blog last year? Well this app will allow anyone with an iPhone (and iPad in the next few days…android soon) to follow Junior from the safety of his/her couch. The voltage of Junior’s tag is slowly dropping to a level that makes “hits” infrequent, but he does surprise us from time to time…like when he surfaced near the surfing break at Point Arena! I would love to hear feedback regarding the app, as we are planning our first update soon. it doesn’t seem that the links to download the app from the website are working. Seems to work ok from itunes app store directly. Just wanted to let you know, in case it wasn’t just a problem with my connection. Thanks Shannon,that link is down but will be up soon. Purchasing through iTunes or App store works perfectly. Very nice app especially since it helps with research to sustain the endangered species.